Step into the terrifying world of storyteller Wolfgang Hohlbein, a mythos inspired by the tales of H. P. Lovecraft. It borrows from H.P. Lovecraft’s Cthulhu mythos as does Arkham Horror, but this is much more of a Euro-style game. Stunning board art by Franz Vohwinkel makes you wish he’d worked on that other game, whose board is somewhat bland. 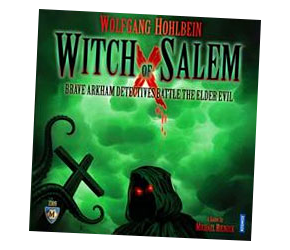 Witch of Salem is a good enough game, but I think I’m getting a bit tired of the current fashion for cooperative games—it’s time to bring back the competitiveness! There are some similarities with Arkham Horror—co-operative investigators in Arkham, gathering objects, closing portals—but the game is in a far simpler style, for a more ‘game-like’ and less roleplaying experience. The artwork is absolutely stunning, especially the board, and the game is extremely challenging, though relatively easy to learn.